Free shipping. Buy direct from HP. 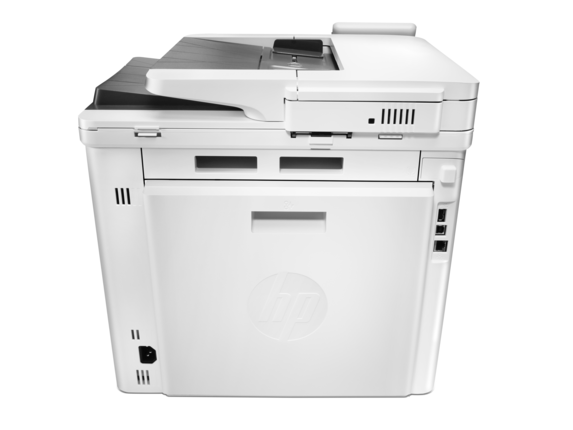 See customer reviews and comparisons for the HP Color LaserJet Pro MFP M477fnw. Upgrades and savings on select products. Based on ISO/IEC 19798 cartridge yields for HP 305X High-Yield Black Original LaserJet Toner Cartridge and 305A Cyan/Magenta/Yellow Original LaserJet Toner Cartridge compared with HP 410X High-Yield Black/Cyan/Magenta/Yellow Original LaserJet Toner Cartridges. Learn more at hp.com/go/learnaboutsupplies. Some scanning features require an Internet connection. Services may require registration. Mobile device must be connected directly to the printer's wireless network prior to printing. Depending on mobile device, an app or driver may also be required. Wireless performance is dependent on physical environment and distance from the access point in the printer. Requires a compatible near-field communications (NFC)-printing-enabled mobile device. For a list of compatible NFC-printing-enabled mobile devices, see http://www.hp.com/go/nfcprinting. Scan digital files directly to email, USB, network folders, and the cloud with preloaded business apps.Grab pages and go—without waiting around. This MFP wakes up and prints faster than the competition.Breeze through multipage documents with two-sided printing that’s faster than the competition.Help keep printing safe—from boot up to shutdown—with embedded features like LDAP authentication. Easily manage print jobs directly at the MFP—just tap and swipe the 4.3-inch (10.9 cm) touchscreen.Easily print Microsoft® Word and PowerPoint® documents—now directly from your USB drive.Easily manage devices and settings using HP Web Jetadmin with a suite of essential management features.Print using less energy than competitors—enhanced by Original HP Toner cartridges with JetIntelligence. Get the most prints for your money—with Original HP High Yield Color Toner cartridges with JetIntelligence.Count on professional quality at high speeds with HP ColorSphere 3 toner.Help ensure you’re getting the authentic HP quality you paid for with innovative anti-fraud technology.Print right away with preinstalled toner cartridges. Replace them with optional high-yield cartridges. Easily print from a variety of smartphones and tablets—generally no setup or apps required.Count on wireless direct printing in the office—from mobile devices—without accessing the company network.Easily access, print, and share resources with Ethernet and wireless networking.Easily access, print, and share resources with Ethernet and wireless networking. If you’re looking for a superior color printer you’ve come to the right place. The HP Color LaserJet Pro MFP M477fnw is one of the best printers money can buy. Whether you need a printer for your business or home office, the HP M477fnw is incredibly versatile and capable of performing a variety of tasks. You can print, copy, scan, fax, and email. Provide documents for your clients at lightning-speeds as well. Now you can you can print up to 28 pages per minute depending on the size and complexity of the imagery and text. When fast printing is crucial, this printer has you covered. Your first page can print out in as fast as 8.9 seconds - black and white or color. You can expect a superior resolution with the HP MFP M477fnw. Considering its ability to print 600 x 600 dpi and up to 38,400 x 600 enhanced dpi pages, you’ll get the crisp visual quality and sharp lines you need to impress coworkers and clients. The 4.3-inch display is yet another feature that makes this printer so impeccable. The user interface technology that’s built in is extremely intuitive. You won’t get lost on a confusing print menu when you’re in a rush to get something done. With a few touches of the button, your project will be printing out before your eyes. Have you ever wished you could print out a 50-page proposal from halfway around the world? Now you can. Thanks to the mobile printing technology that’s been incorporated into the HP M477fnw, you can print with the click of a button. Print from anywhere in the world using HP ePrint, Apple Airprint™, or Google Cloud Print 2.0. 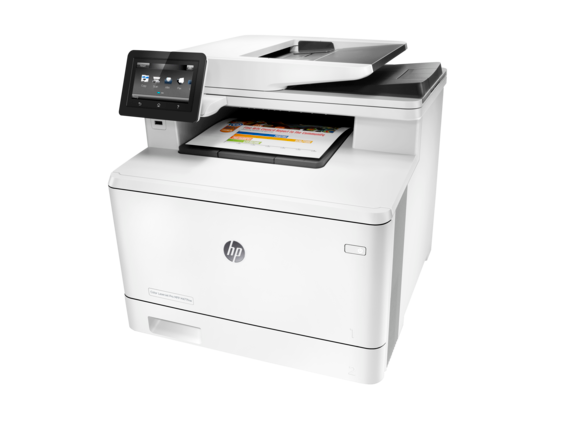 The ability to print remotely without having to connect to your company WiFi network is just one of many features that makes HP LaserJet Pro Color Printers so fantastic. No matter what kind of mobile device you have, HPⓇ has a solution for you. Because so many printers and devices are directly connected to networks and PCs, hackers have gotten creative with how they try to access your data. If you aren’t buying a printer with some serious security measures, you could be putting your data at risk. In today’s business world, it’s crucial that you safeguard sensitive information - both your own and that of your clients. The HP Color LaserJet Pro MFP M477fnw comes with an embedded web server with password protection, sure browsing via SSL/TLS. With the superior protection this printer offers, you won’t have to worry about any unwanted data leaks. You can even encrypt precious files and documents with AES or TKIP. If by some miracle, a hacker does manage to get past the firewall, they will have an extremely difficult time deciphering your data. 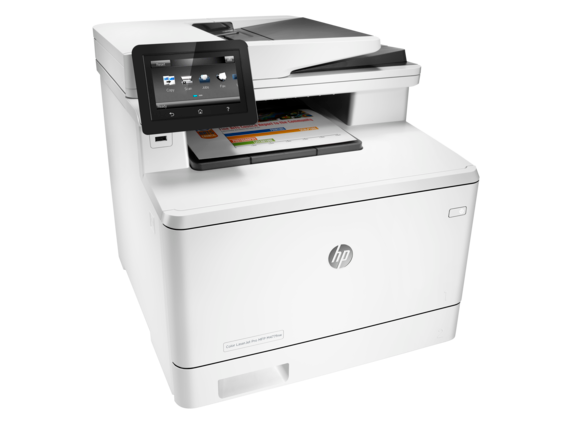 The HP M477fnw is ENERGY STAR® certified, making it one of the best printers for anyone trying cut back on their power bill or make a positive impact on the environment. This printer is even smart enough to conserve energy when it’s not being actively used, meaning you save money and benefit the earth. Your new HP M477fnw will only consume 2.5 watts while in sleep mode, and a mere 0.05 watts while shutdown or off. No phantom energy worries here. 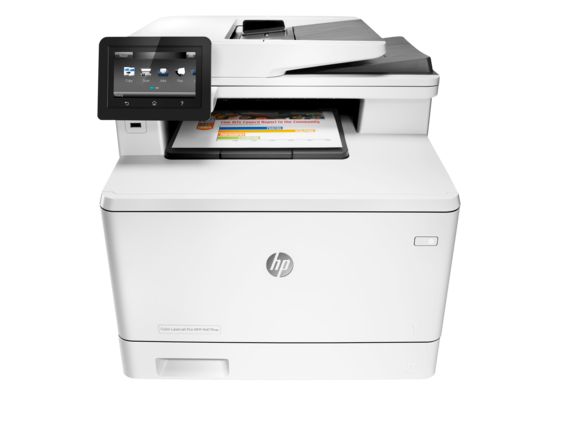 No matter what your HP printer’s primary purpose may be, whether it’s for personal use or business needs, the HP Color LaserJet Pro MFP M477fnw is fully capable of taking on any task.